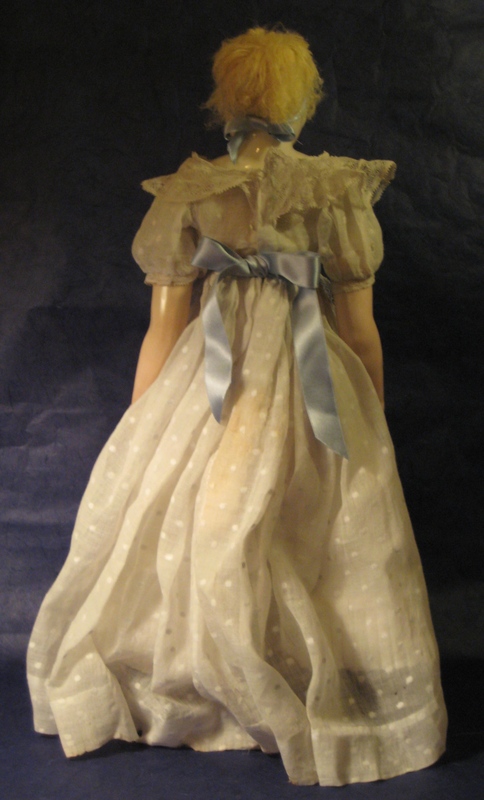 Adelaide Calixte Huret first patented an articulated doll with a porcelain head in 1850 in France. 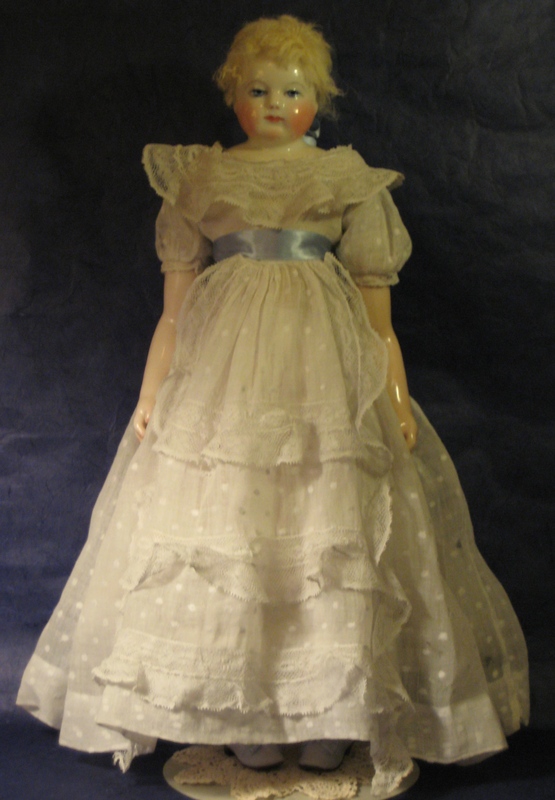 Her doll represented an idealized child, with a dreamy face and a light-weight, hollow gutta percha body. 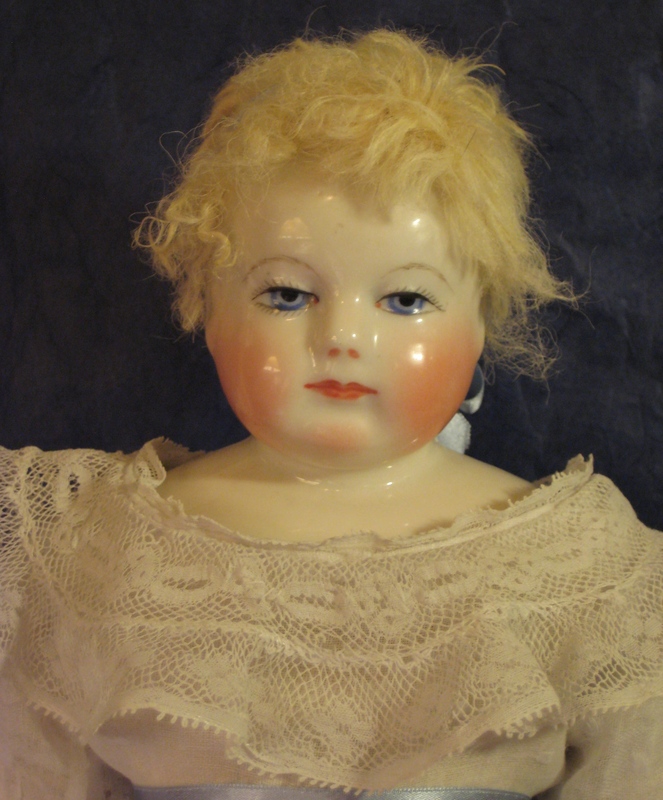 The earliest dolls, like mine, had glazed porcelain heads. Later Hurets were made with unglazed (or bisque) heads. All were 45cm or 17 3/4″ tall. The years from 1850 to 1880 in Paris were the Golden Age of Dolls with more than 200 businesses engaged in making dolls and their clothing, furniture and accessories. 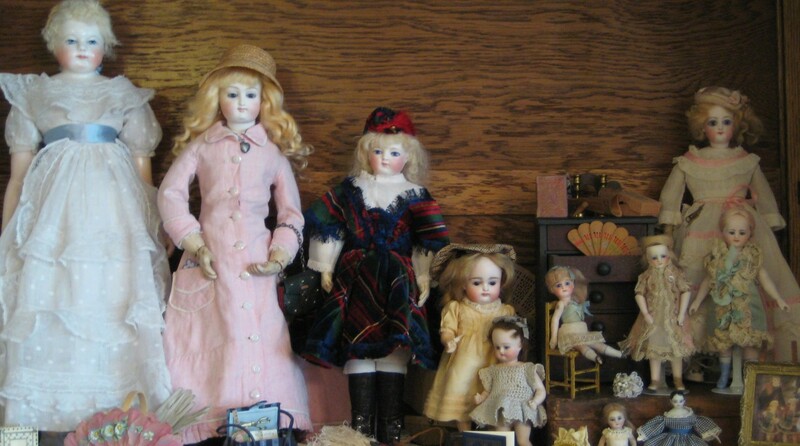 There were shops devoted to wig or shoe making and couture houses that provided costumes for these dolls. 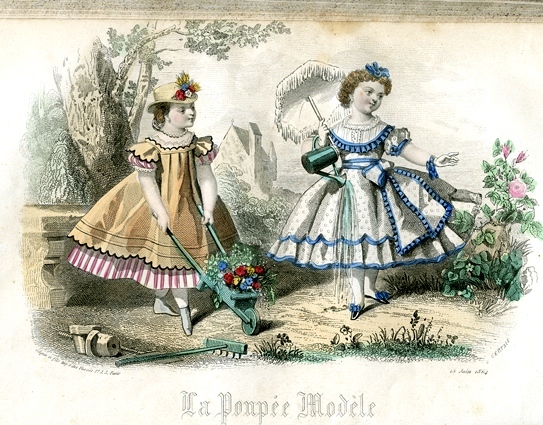 Several shops published magazines exclusively devoted to young girls and their dolls, such as La Poupee Modele, and Gazette de la Poupee. These magazines featured articles, stories, fashion plates and patterns for dressing 45 cm dolls. Since the Huret doll represented a child, the costumes of early Hurets were usually child-like, or la mode enfantine. However, the same doll would often be dressed and played with as a baby, child or lady. Young girls were encouraged to care for and sew for their dolls to learn the skills they would need as women. In a future post, I will discuss costume inspiration and will give sources for costume ideas. The Huret Book, by Danielle & Francois Theimer is available from Dollspart. The English translation is a bit rough, and sometimes comical, but the basic information is interesting and the photos are amazing. The Trousseau of Blondinette Davranches, by Florence Theriault can be found used on Amazon. It shows a lovely early Huret and her original trousseau. My Huret is over 150 years old. The earliest Huret dolls, like mine, had glazed porcelain (China) heads. Her original gutta percha body is gone. Gutta percha is a latex/rubber derived from a Malaysian tree. It becomes brittle with age, so not many gutta percha doll bodies have survived. At some point in her life my Huret got a French leather poupee body with glazed porcelain arms. With her leather body, she is a bit shorter than the Huret standard of 45cm. She has a blonde skin wig. So, why is my Huret special to me? Of course, she is gorgeous. But, it’s all about the possibilities! She is a needy doll and I have been tasked with completing her trousseau. She needs clothes, hats, jewelry, shoes, socks, purses, gloves, toys, furniture and more. Look at that face! Who am I to deny her anything? Hello? I have purhase a Huret doll, last week, but she is about 35 cm tall, her body is pink leather and feels very hard…If it is Gutta percha or not, I do not know…. Is it possible that my Huret is only 35 cm tall? Thank you so much, Carla. It is absolutely a Huret, glazed head. How high/tall should the hat be? Hi Carla, I saw the picture of your beautiful doll on Facebook. Congratulations, she is lovely. When a Huret doll is on her original gutta percha body, it is 45cm tall. But since the gutta percha rarely lasted, many Hurets are on replacement kid or wooden bodies. The different body can change the height of the doll. Gutta percha bodies do not look like kid bodies at all. They look more like wood bodies, but with a different texture. To compare, try to find pictures online. Theimer’s “Huret Book” is good to have for reference. Do you have pictures of the Provost period of Huret dolls? I have seen two of the lady fashion type. They are lovely, but different than the earlier dolls? It seems difficult to find these dolls and their pictures. Thank you. Sorry, but I do not. The best Huret photos, all eras, are in Francois Theimer’s Huret Book. Thanks for reading my blog. How brittle and fragile is the gutta percha body? I have a friend with a Huret doll and a Huret chair and she said just sitting the doll, tiny parts would break off. Can you give any details as to the future of the gutta percha body? are some stronger and in better condition than others? are they all very very fragile at this point? I have an opportunity to purchase a beautiful Huret but with a gutta percha body. I am a little heavy handed with my dolls and do like to handle them, dress them, pose them. Does anyone have any comments are advise for me. 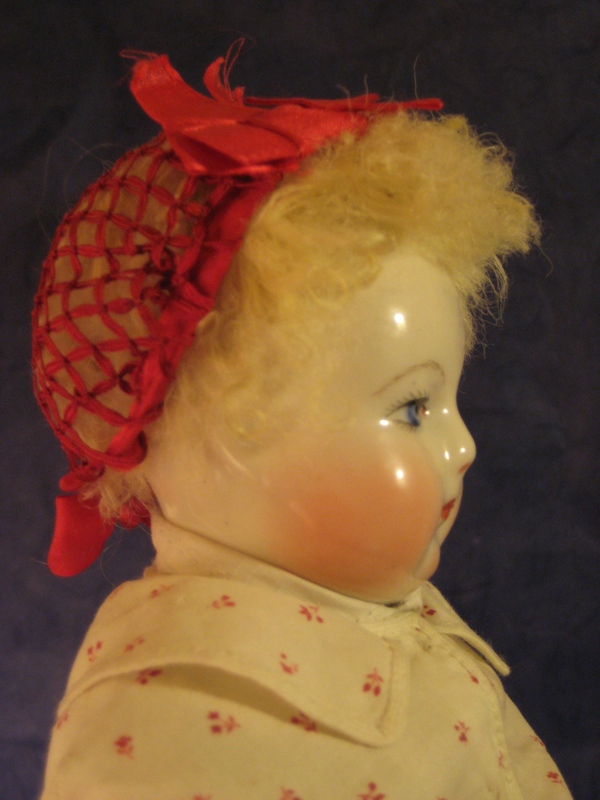 Hi Connie, I haven’t ever handled a gutta percha doll body, but have heard all the talk about how fragile it is. If I was going to get a Huret with a gp body, I think I wouldn’t want to handle her much. I might dress her once and leave her alone. Good luck with your tough decision.